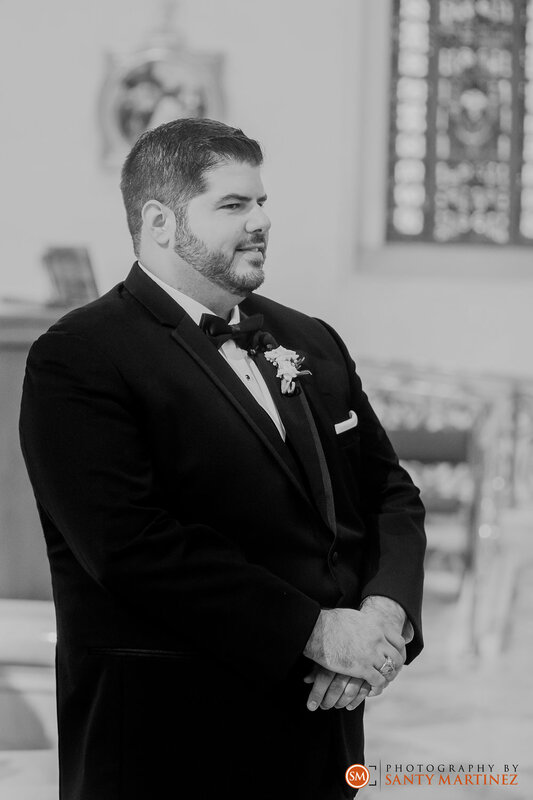 There’s a lot to be excited about over this Miami Beach wedding. Every detail was impeccable and every moment was meaningful. 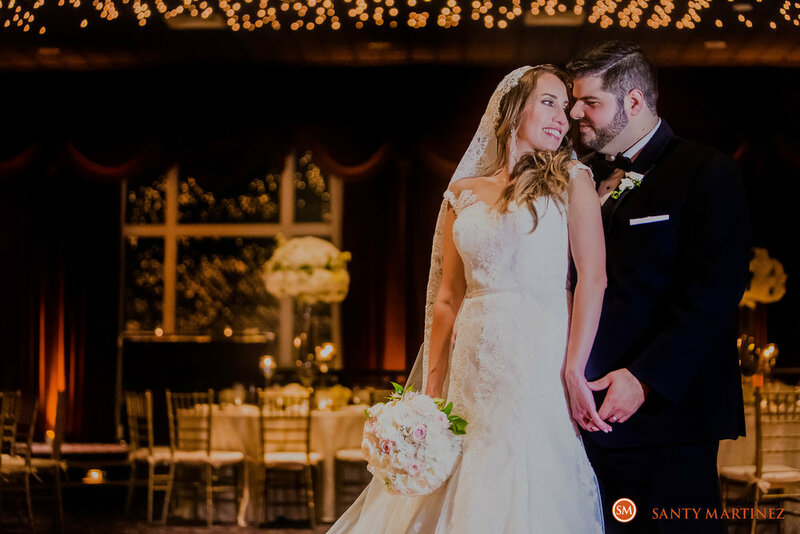 Guests drank, dined, and danced the night away under the most beautiful ballroom ceiling in town – all in celebration of the union of Denisse and John. Anyone who knows this couple can attest that their love is certainly worth celebrating! 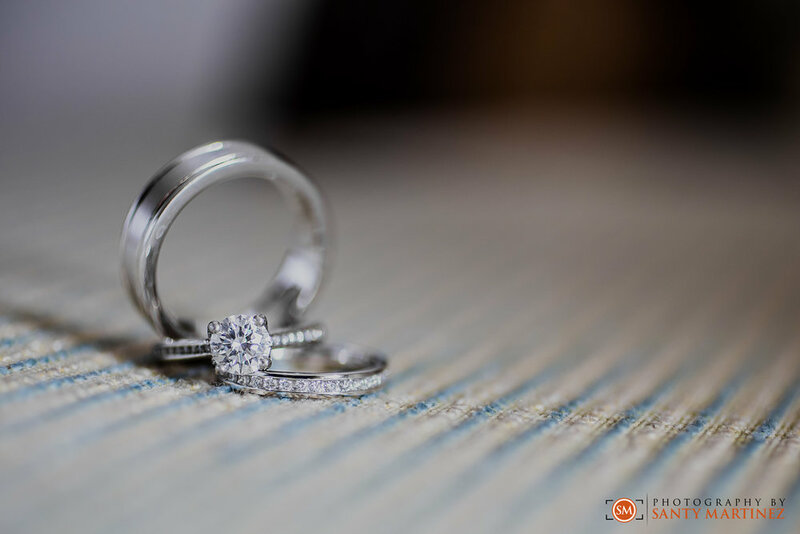 Getting ready to say “I do” – Denisse and John both got ready at the Miami Beach Resort and Spa. This portion of the day is one of our favorites! There is a lot of preparation that goes on before the big show and we love being there to capture it. It’s important for us to capture all of the details in addition to snapping all of those candid shots. 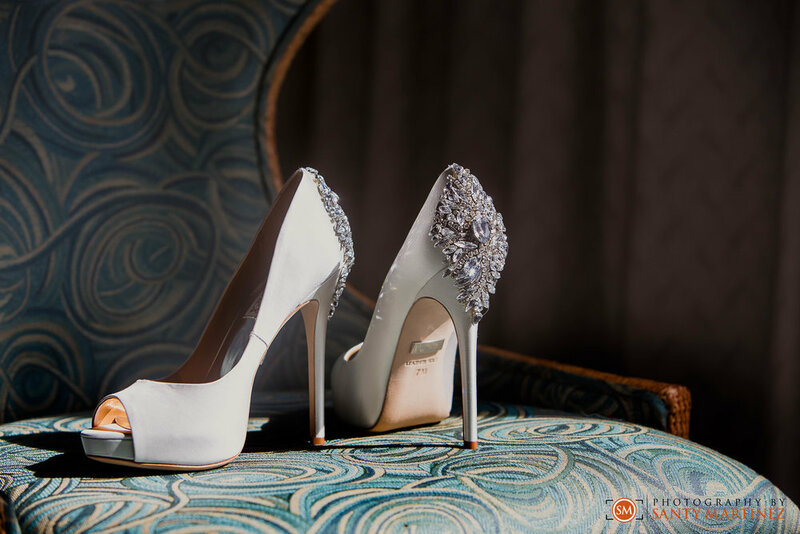 We carefully stage the dress, the shoes and of course, the rings! 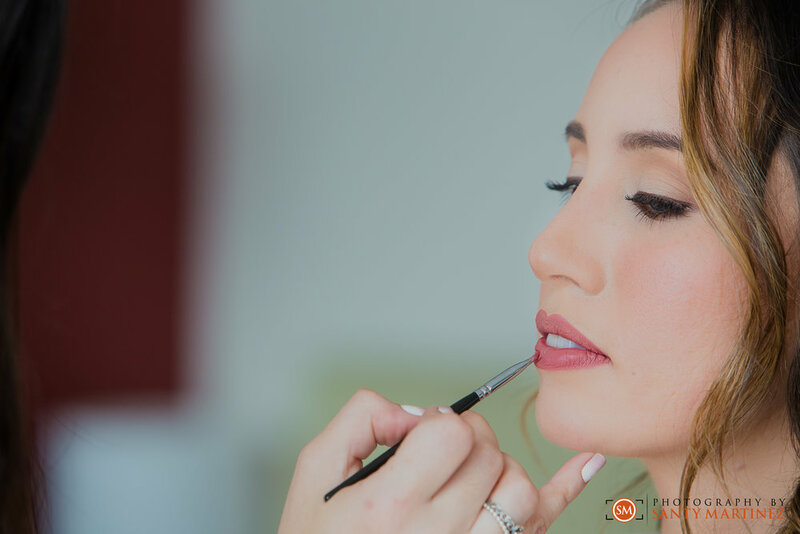 Makeup shots are a wonderful way to focus on the bride’s beauty as she glams up for her groom. And there is always a bit of raw emotion the moment the bride steps into her gown and is seen by her mom and bridesmaids for the first time. We like to think of the “getting ready” as an event of its own before the main event. 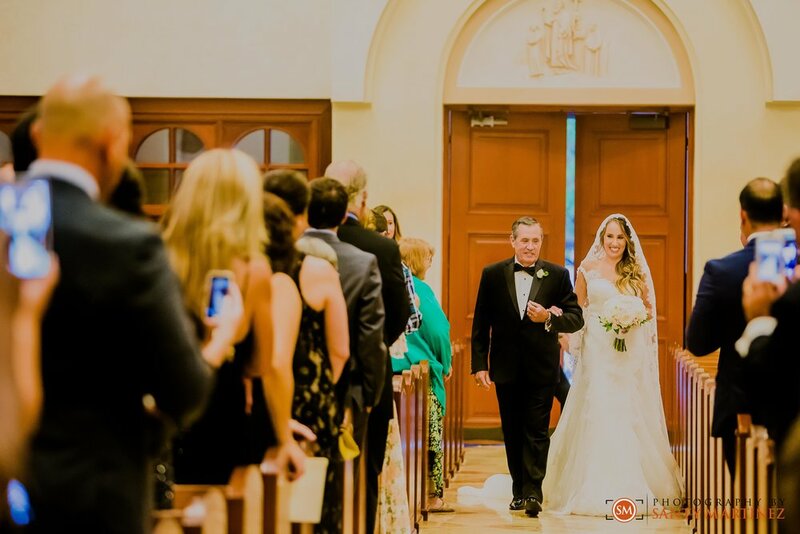 Saying “I do” – The ceremony took place at St. Patrick’s Catholic Church. This was the first Catholic parish on Miami Beach and has a beautiful history with the city. The ceremony was both traditional and heartwarming. Having two photographers is usually recommended as it allows us to capture two angles simultaneously. 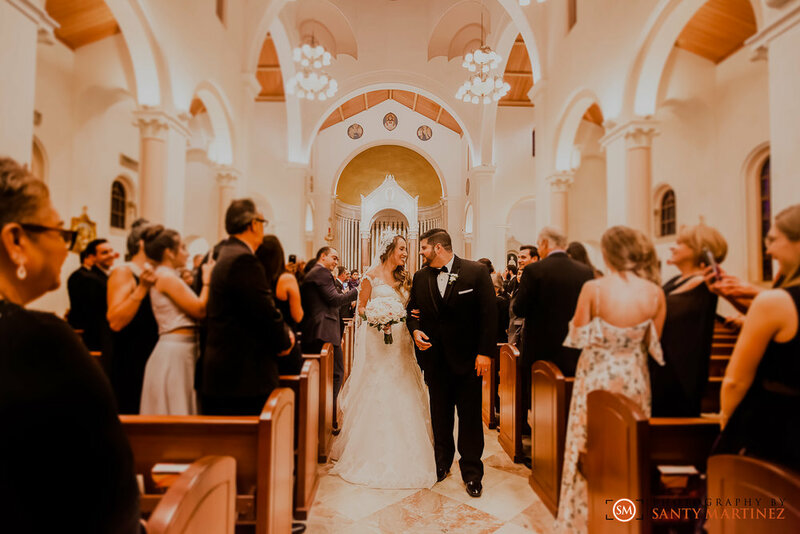 In this case, we were able to catch Denisse as she anxiously waited to enter the church along with her father while also being in place to capture John’s reaction to seeing his bride for the first time in her dress. After the ceremony, we had a very short window of time to take family formals and portraits. It rained a bit while Denisse and John were busy getting married inside – it’s a good thing she found herself a husband willing to help her with her dress so it wouldn’t get wet! We made the best of it and even got some fun shots out of the scenario. Luckily, these two had already pre-planned a post wedding session so a little rain wasn’t an issue for them. They were just ready to get to the party! 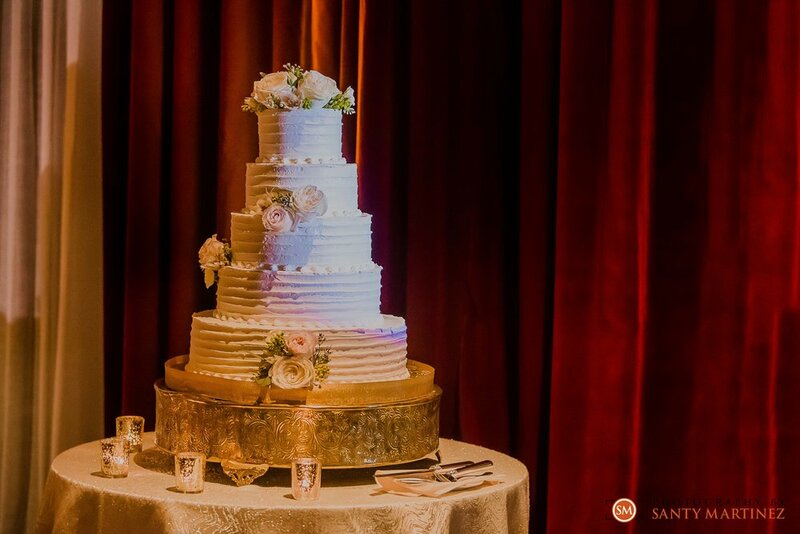 They said “I do” – Now that it was official – it was time to celebrate! 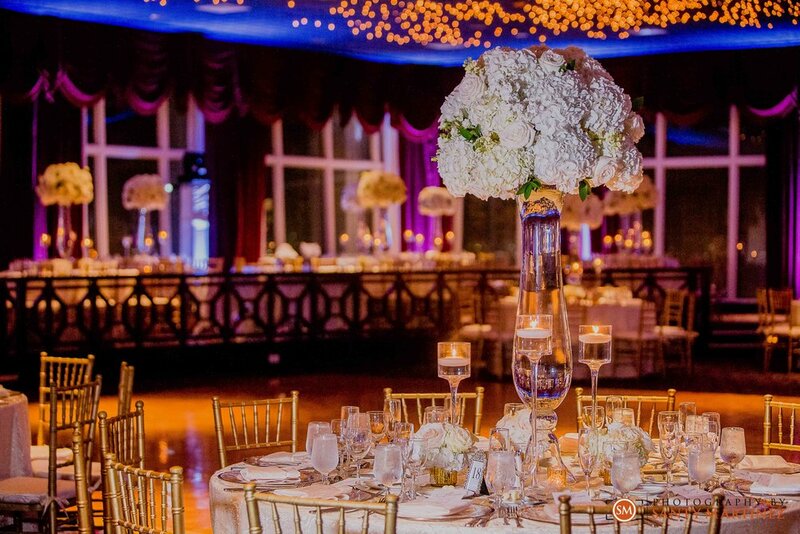 Back at the Miami Beach Resort and Spa, guests were already enjoying cocktail hour as the couple snuck into the ballroom to view their exquisite décor. 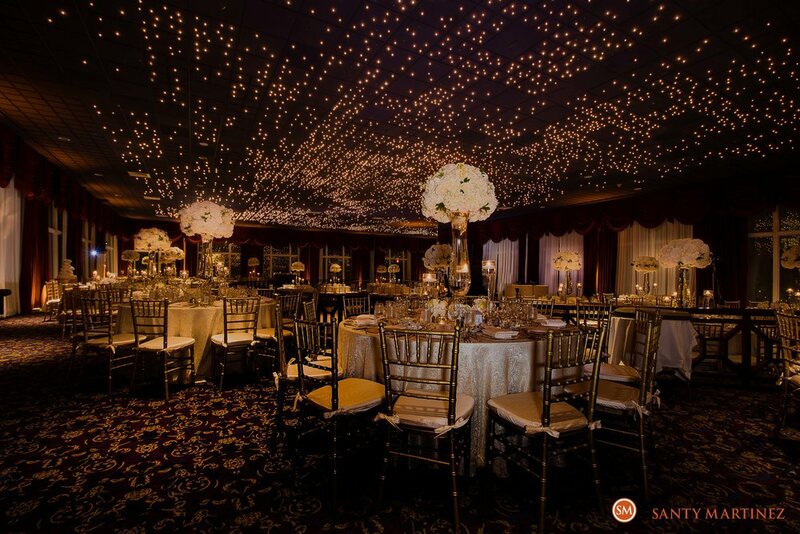 The resort’s famous starlight room was simply spectacular, the floral arrangements were breathtakingly beautiful, the up-lighting provided by the DJ company helped set the stage for what was to come, and it was all seamlessly executed by one of the best event planners in the business. 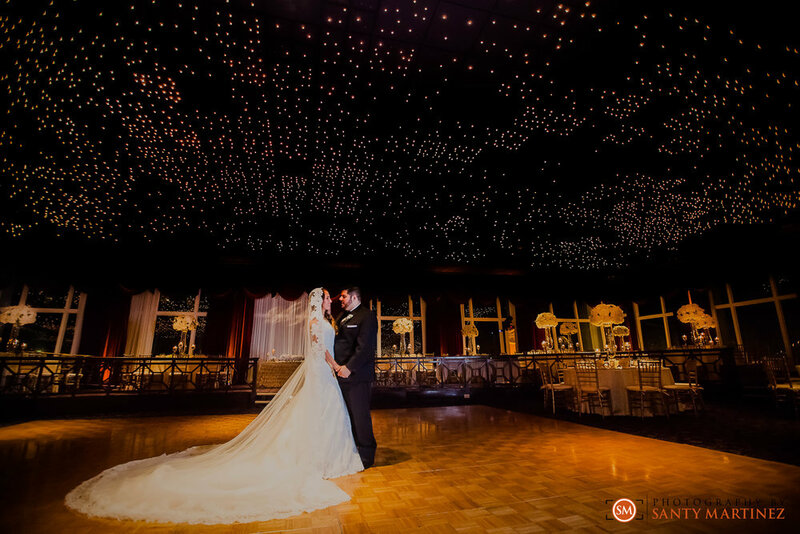 We make sure to capture all the perfectly selected details – but the ballroom shot is not complete in our eyes unless the couple is in it. This is their day, their moment, and their décor before it’s touched by guests. Every wedding, every reception is different. However, this celebration had a few “extras” that put it in a class of its own. 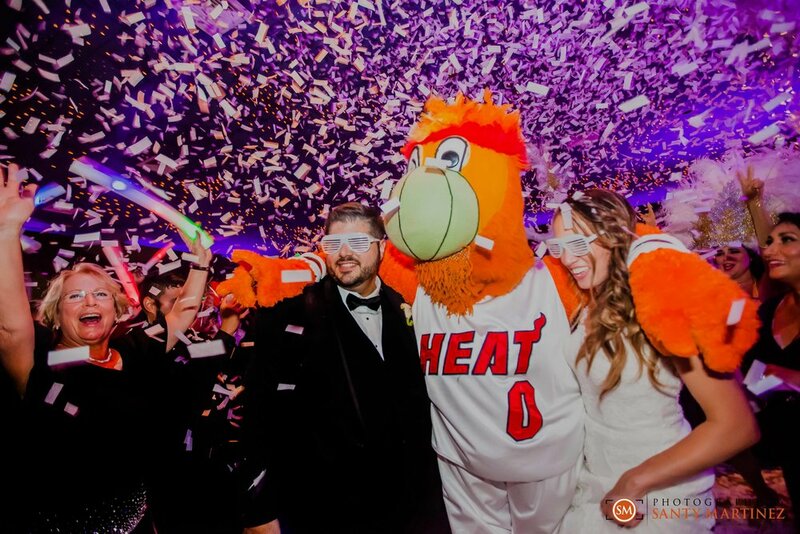 We try to expect the unexpected at all weddings so that we are prepared for anything yet it was difficult to be prepared the moment Bernie from the Miami Heat joined the party! Couple his appearance with Hora Loca dancers, a confetti canon shooting 50 lbs. 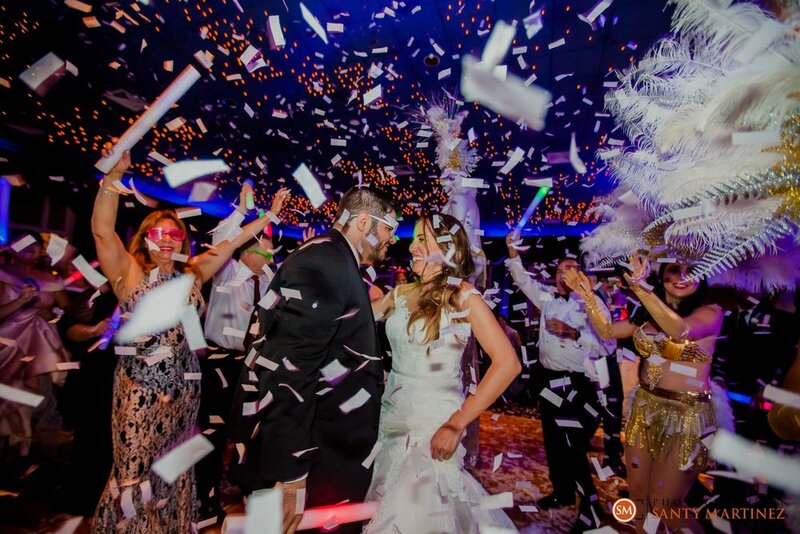 of confetti onto the dance floor and some of the best music mixing in Miami, this was a celebration for the books! Everyone was having fun! It was clear that all their guests were over the moon for Denisse and John tying the knot. 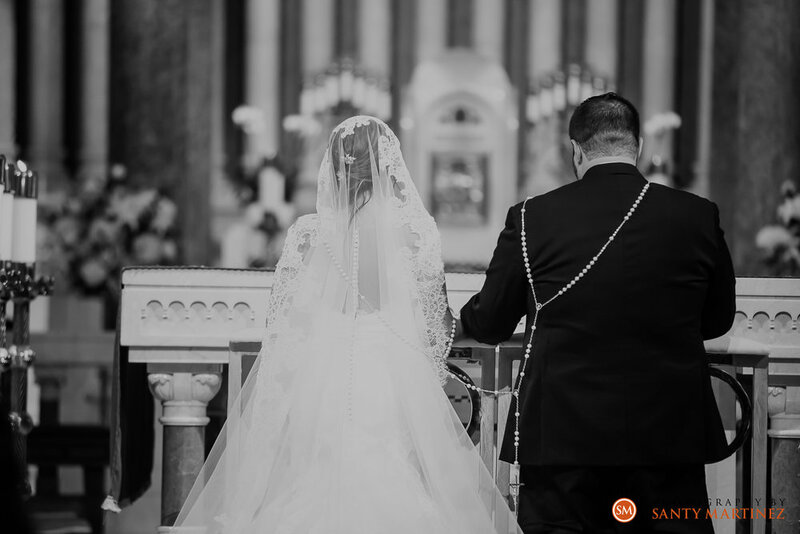 We hope you enjoy this sneak peek into their wedding day and join us in congratulating them! Contact us if you have any questions about our photography services – we would love to capture your next event!